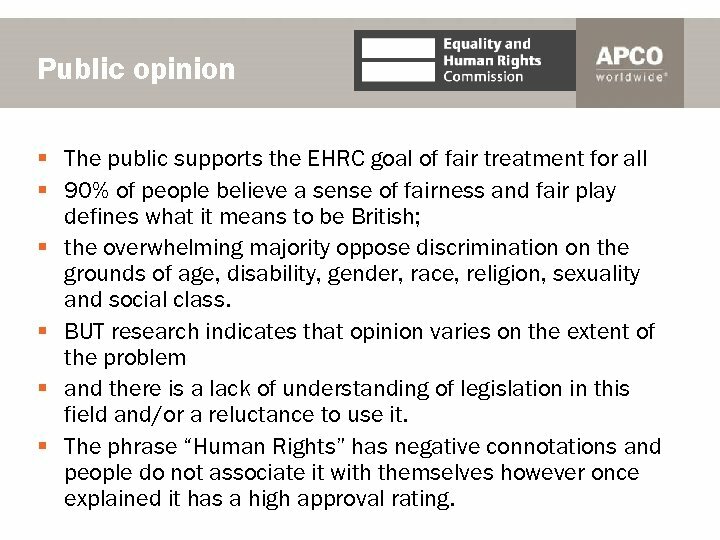 Public opinion § The public supports the EHRC goal of fair treatment for all § 90% of people believe a sense of fairness and fair play defines what it means to be British; § the overwhelming majority oppose discrimination on the grounds of age, disability, gender, race, religion, sexuality and social class. § BUT research indicates that opinion varies on the extent of the problem § and there is a lack of understanding of legislation in this field and/or a reluctance to use it. § The phrase “Human Rights” has negative connotations and people do not associate it with themselves however once explained it has a high approval rating. 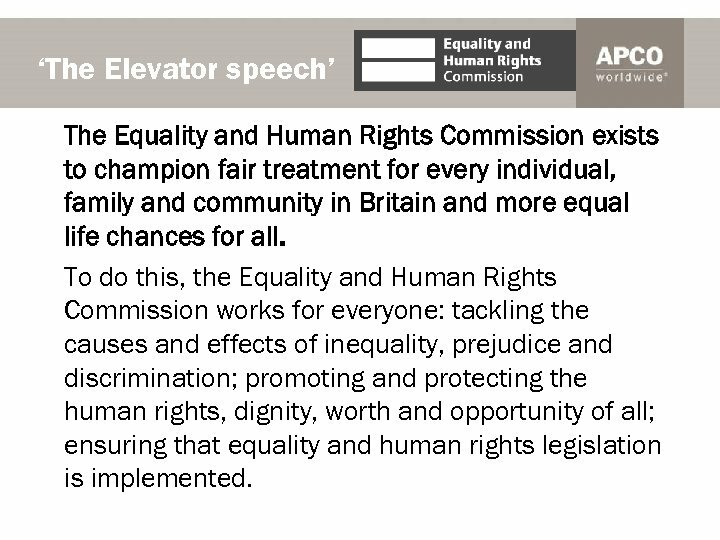 ‘The Elevator speech’ The Equality and Human Rights Commission exists to champion fair treatment for every individual, family and community in Britain and more equal life chances for all. 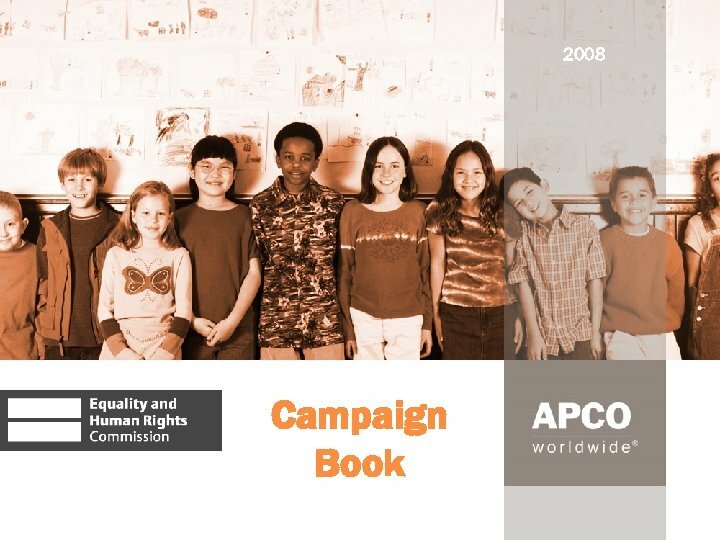 To do this, the Equality and Human Rights Commission works for everyone: tackling the causes and effects of inequality, prejudice and discrimination; promoting and protecting the human rights, dignity, worth and opportunity of all; ensuring that equality and human rights legislation is implemented. 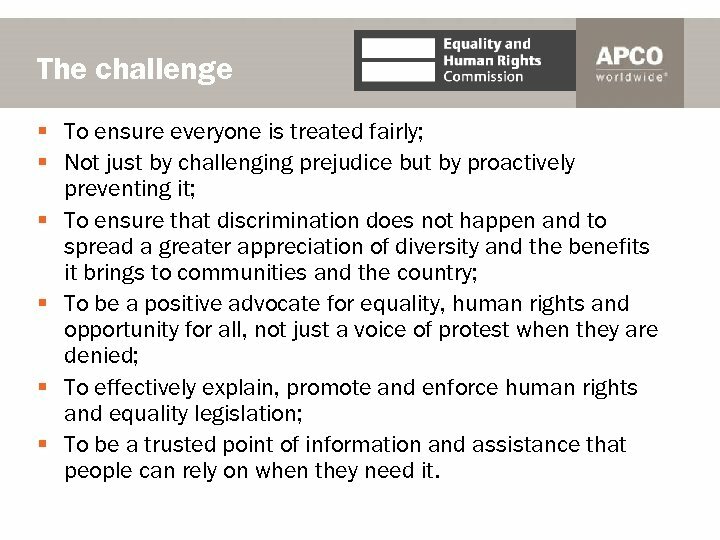 The challenge § To ensure everyone is treated fairly; § Not just by challenging prejudice but by proactively preventing it; § To ensure that discrimination does not happen and to spread a greater appreciation of diversity and the benefits it brings to communities and the country; § To be a positive advocate for equality, human rights and opportunity for all, not just a voice of protest when they are denied; § To effectively explain, promote and enforce human rights and equality legislation; § To be a trusted point of information and assistance that people can rely on when they need it. 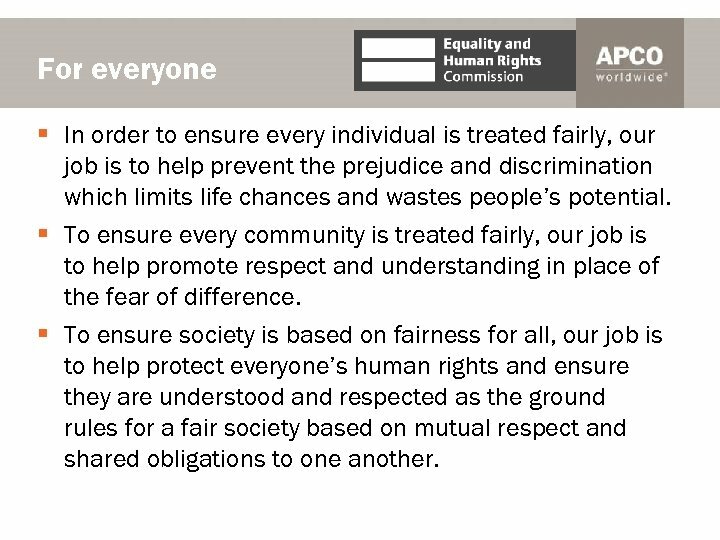 For everyone § In order to ensure every individual is treated fairly, our job is to help prevent the prejudice and discrimination which limits life chances and wastes people’s potential. § To ensure every community is treated fairly, our job is to help promote respect and understanding in place of the fear of difference. § To ensure society is based on fairness for all, our job is to help protect everyone’s human rights and ensure they are understood and respected as the ground rules for a fair society based on mutual respect and shared obligations to one another. 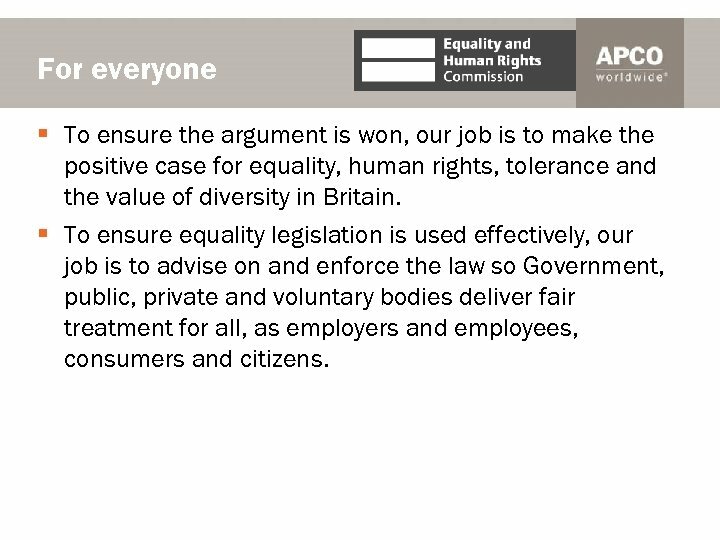 For everyone § To ensure the argument is won, our job is to make the positive case for equality, human rights, tolerance and the value of diversity in Britain. 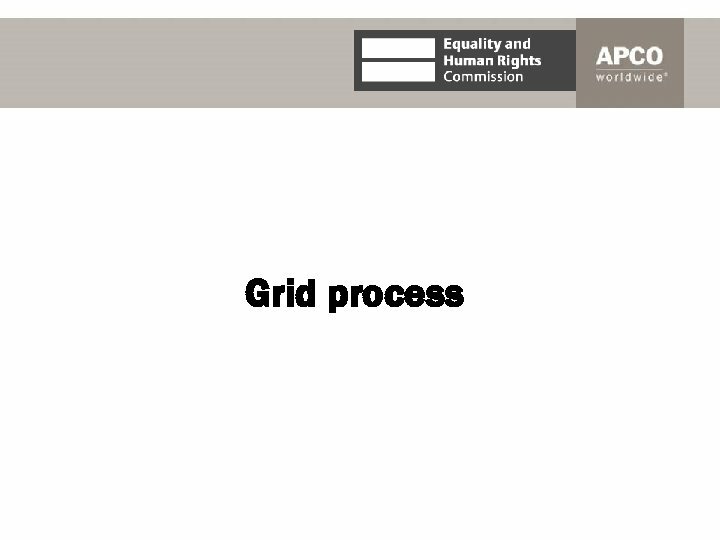 § To ensure equality legislation is used effectively, our job is to advise on and enforce the law so Government, public, private and voluntary bodies deliver fair treatment for all, as employers and employees, consumers and citizens. 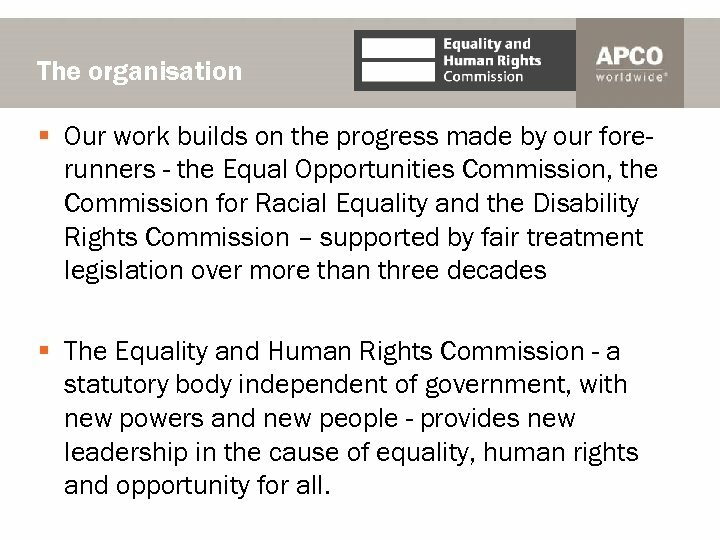 The organisation § Our work builds on the progress made by our forerunners - the Equal Opportunities Commission, the Commission for Racial Equality and the Disability Rights Commission – supported by fair treatment legislation over more than three decades § The Equality and Human Rights Commission - a statutory body independent of government, with new powers and new people - provides new leadership in the cause of equality, human rights and opportunity for all. 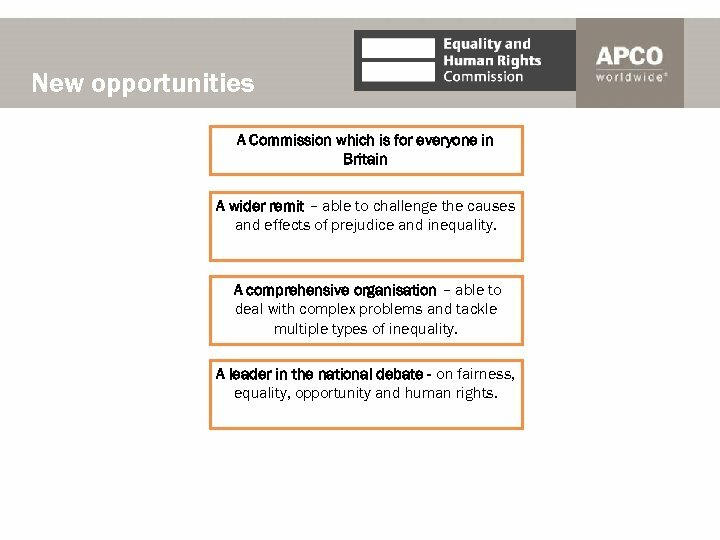 New opportunities A Commission which is for everyone in Britain A wider remit – able to challenge the causes and effects of prejudice and inequality. A comprehensive organisation – able to deal with complex problems and tackle multiple types of inequality. A leader in the national debate - on fairness, equality, opportunity and human rights. 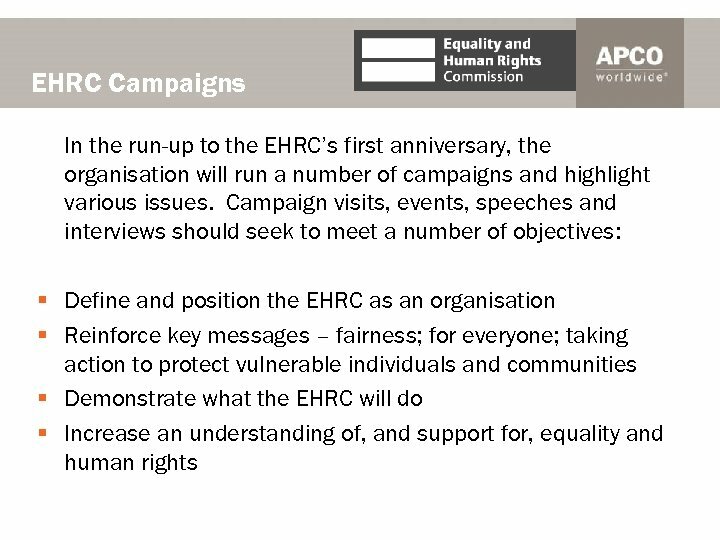 Who we are The Equality and Human Rights Commission (EHRC) champions fair treatment for everyone and a fair chance for every individual, family and community in Britain. 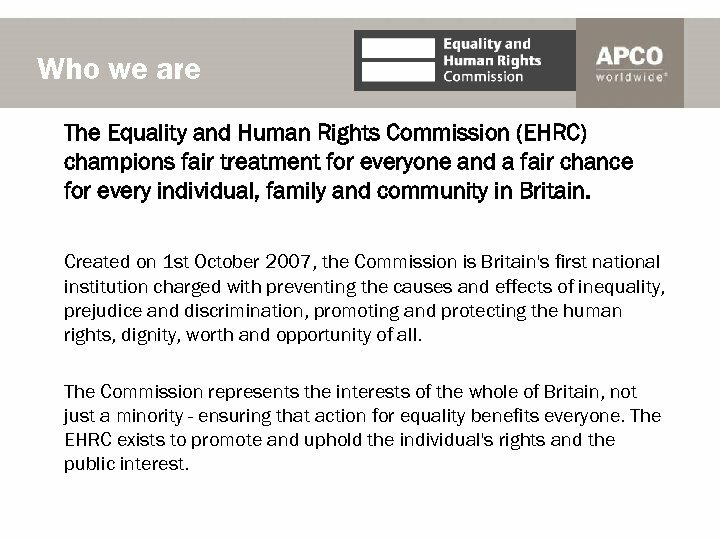 Created on 1 st October 2007, the Commission is Britain's first national institution charged with preventing the causes and effects of inequality, prejudice and discrimination, promoting and protecting the human rights, dignity, worth and opportunity of all. 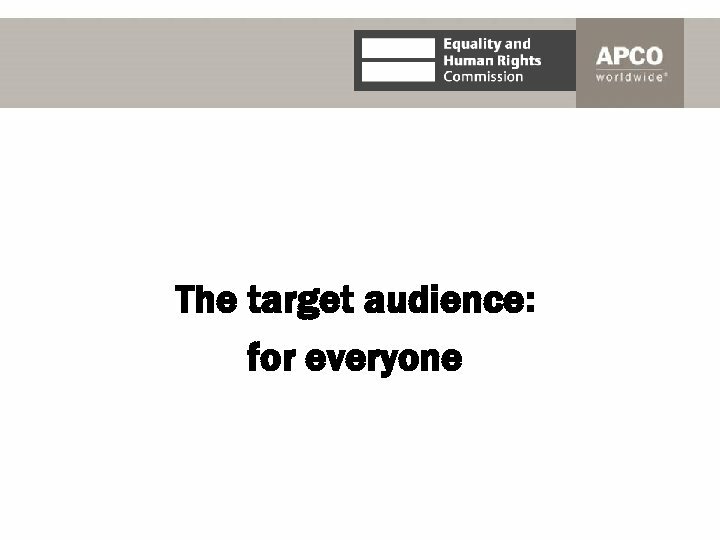 The Commission represents the interests of the whole of Britain, not just a minority - ensuring that action for equality benefits everyone. 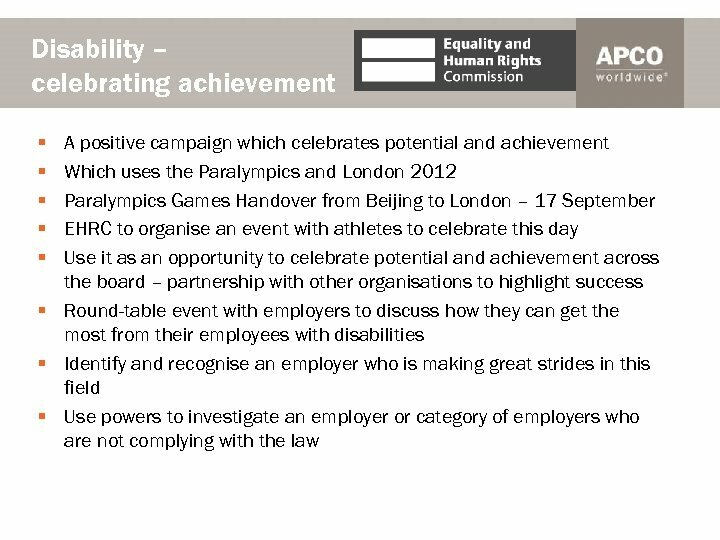 The EHRC exists to promote and uphold the individual's rights and the public interest. 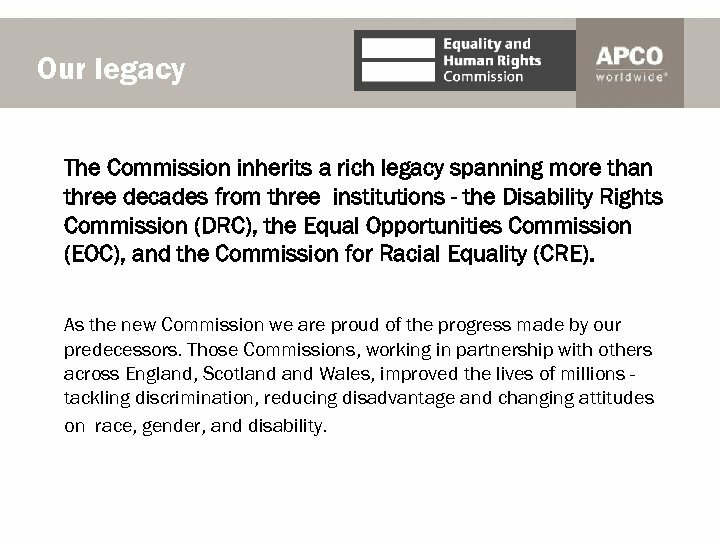 Our legacy The Commission inherits a rich legacy spanning more than three decades from three institutions - the Disability Rights Commission (DRC), the Equal Opportunities Commission (EOC), and the Commission for Racial Equality (CRE). As the new Commission we are proud of the progress made by our predecessors. 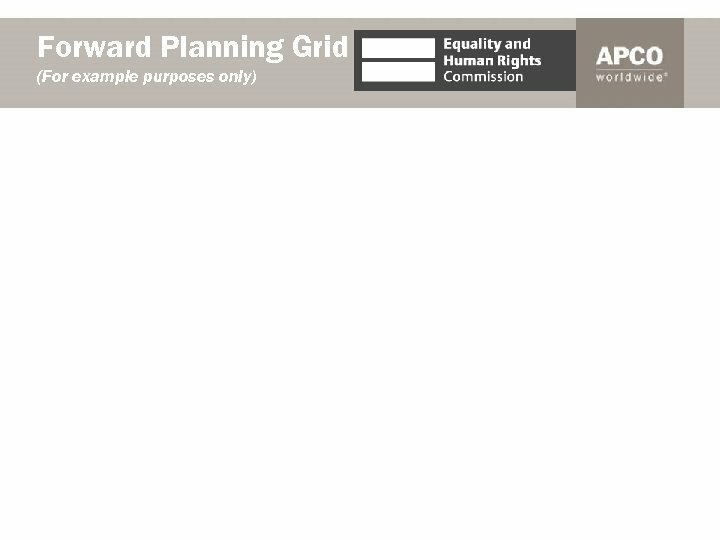 Those Commissions, working in partnership with others across England, Scotland Wales, improved the lives of millions tackling discrimination, reducing disadvantage and changing attitudes on race, gender, and disability. 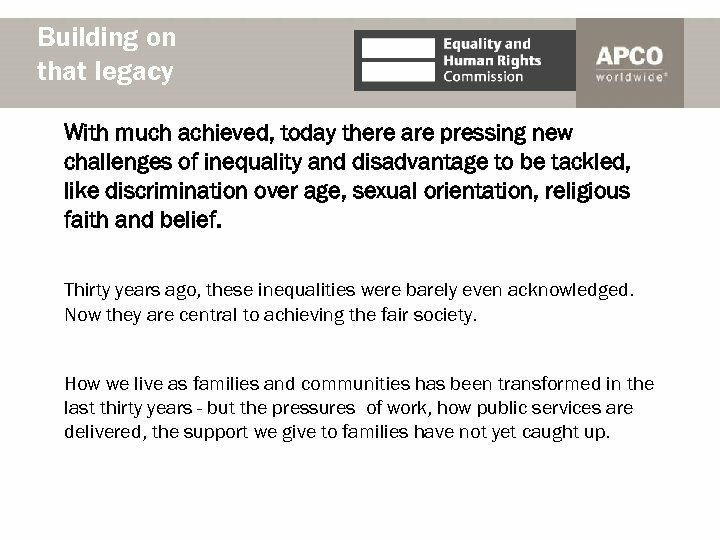 Building on that legacy With much achieved, today there are pressing new challenges of inequality and disadvantage to be tackled, like discrimination over age, sexual orientation, religious faith and belief. Thirty years ago, these inequalities were barely even acknowledged. Now they are central to achieving the fair society. How we live as families and communities has been transformed in the last thirty years - but the pressures of work, how public services are delivered, the support we give to families have not yet caught up. 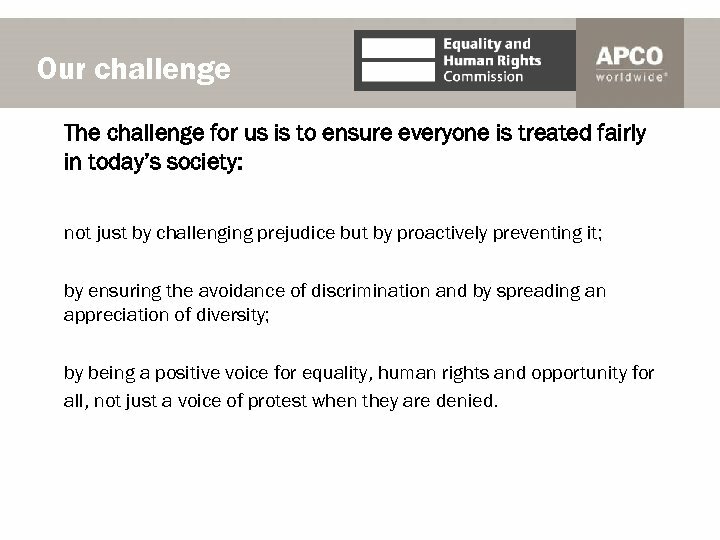 Our challenge The challenge for us is to ensure everyone is treated fairly in today’s society: not just by challenging prejudice but by proactively preventing it; by ensuring the avoidance of discrimination and by spreading an appreciation of diversity; by being a positive voice for equality, human rights and opportunity for all, not just a voice of protest when they are denied. 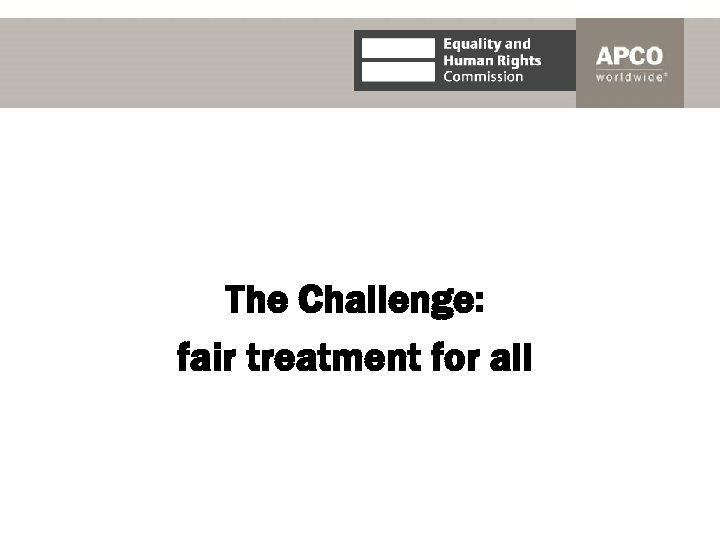 Fairness in a changing World Standing up for equality can be even more challenging in a rapidly changing world. 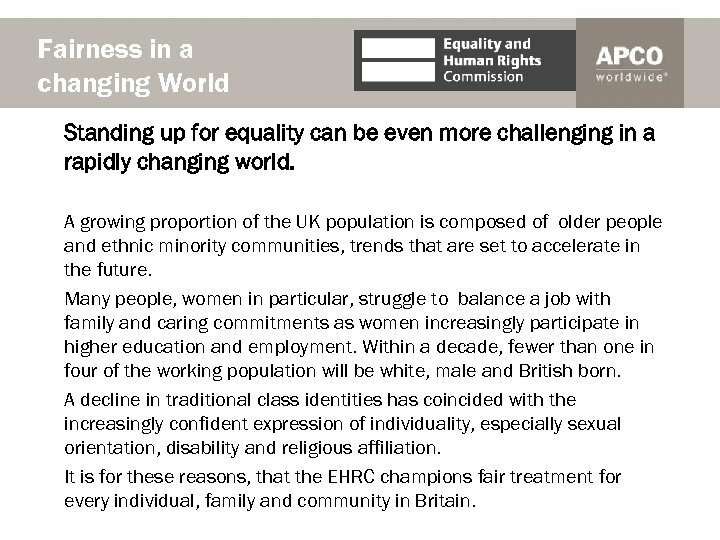 A growing proportion of the UK population is composed of older people and ethnic minority communities, trends that are set to accelerate in the future. Many people, women in particular, struggle to balance a job with family and caring commitments as women increasingly participate in higher education and employment. Within a decade, fewer than one in four of the working population will be white, male and British born. A decline in traditional class identities has coincided with the increasingly confident expression of individuality, especially sexual orientation, disability and religious affiliation. 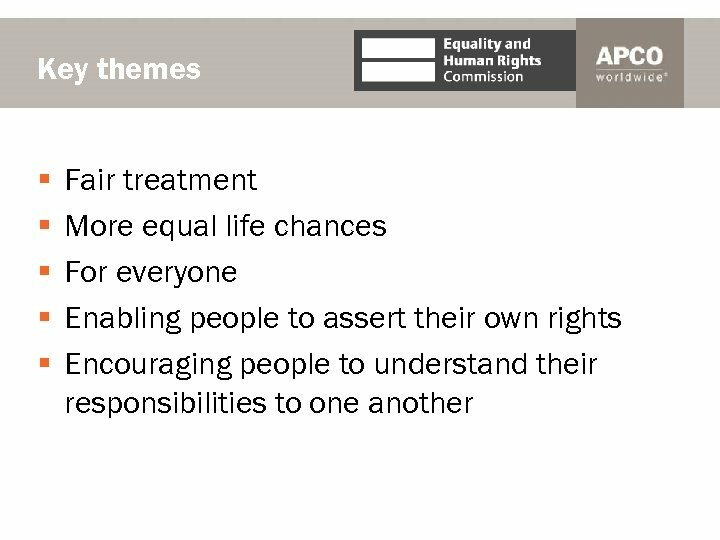 It is for these reasons, that the EHRC champions fair treatment for every individual, family and community in Britain. 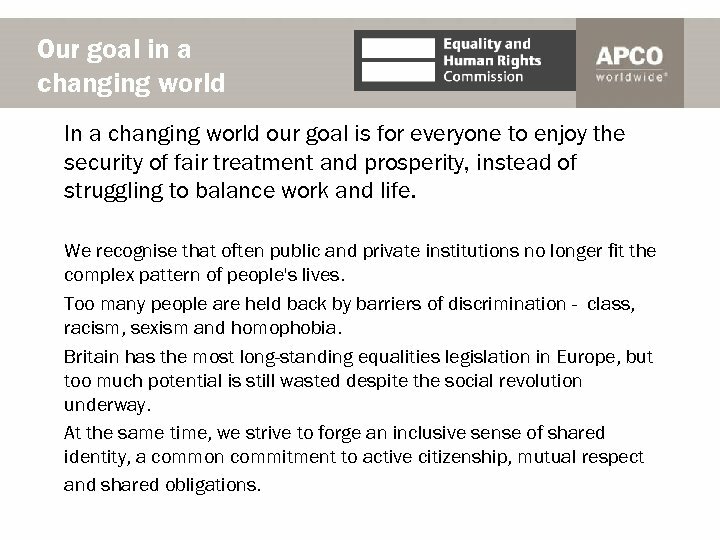 Our goal in a changing world In a changing world our goal is for everyone to enjoy the security of fair treatment and prosperity, instead of struggling to balance work and life. We recognise that often public and private institutions no longer fit the complex pattern of people's lives. Too many people are held back by barriers of discrimination - class, racism, sexism and homophobia. 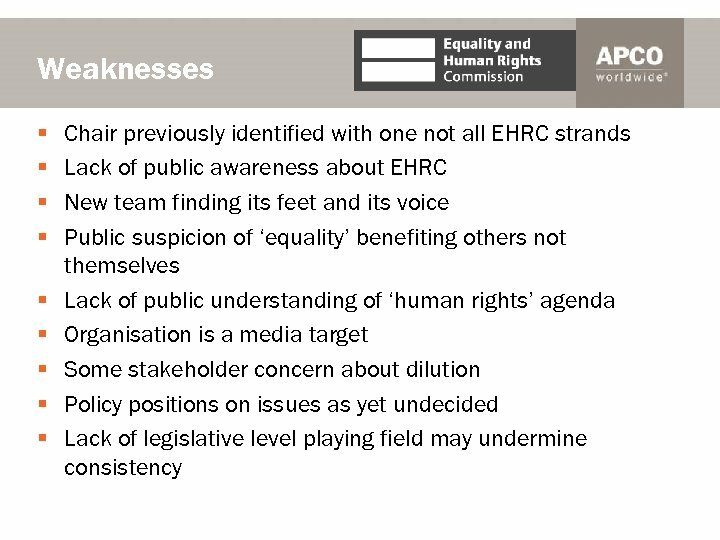 Britain has the most long-standing equalities legislation in Europe, but too much potential is still wasted despite the social revolution underway. At the same time, we strive to forge an inclusive sense of shared identity, a common commitment to active citizenship, mutual respect and shared obligations. Promoting human rights Our role is to help protect everyone’s human rights and ensure they are understood and respected as the ground rules for a fair society based on mutual respect and shared obligations to one another. The tradition of tolerance, freedom of speech and respect for liberty are fundamental values of a decent, civilised society. 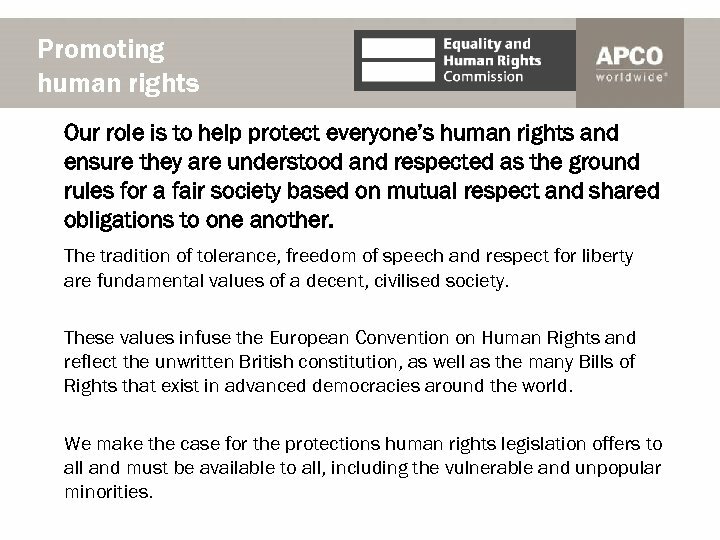 These values infuse the European Convention on Human Rights and reflect the unwritten British constitution, as well as the many Bills of Rights that exist in advanced democracies around the world. 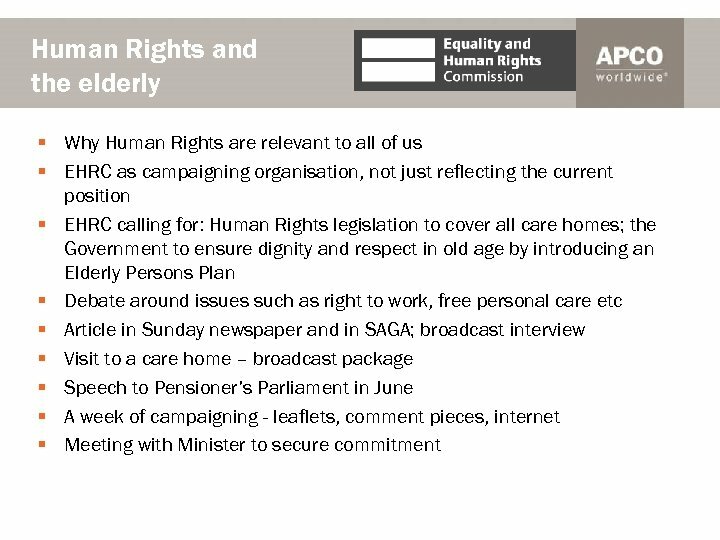 We make the case for the protections human rights legislation offers to all and must be available to all, including the vulnerable and unpopular minorities. 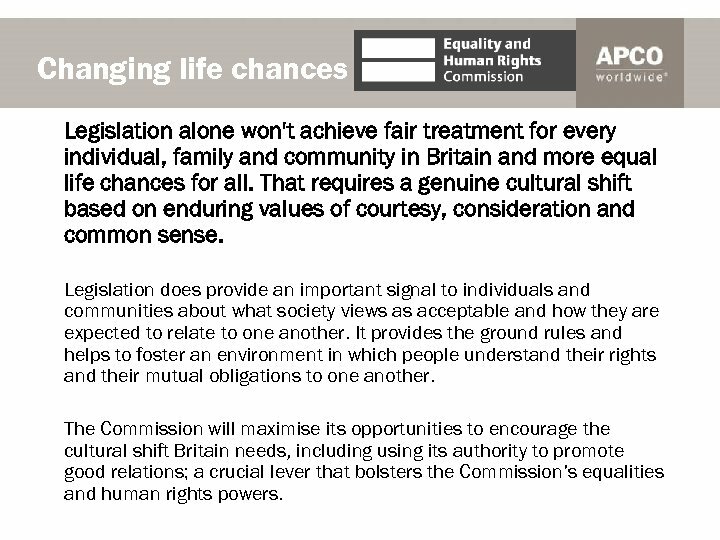 Changing life chances Legislation alone won't achieve fair treatment for every individual, family and community in Britain and more equal life chances for all. That requires a genuine cultural shift based on enduring values of courtesy, consideration and common sense. Legislation does provide an important signal to individuals and communities about what society views as acceptable and how they are expected to relate to one another. 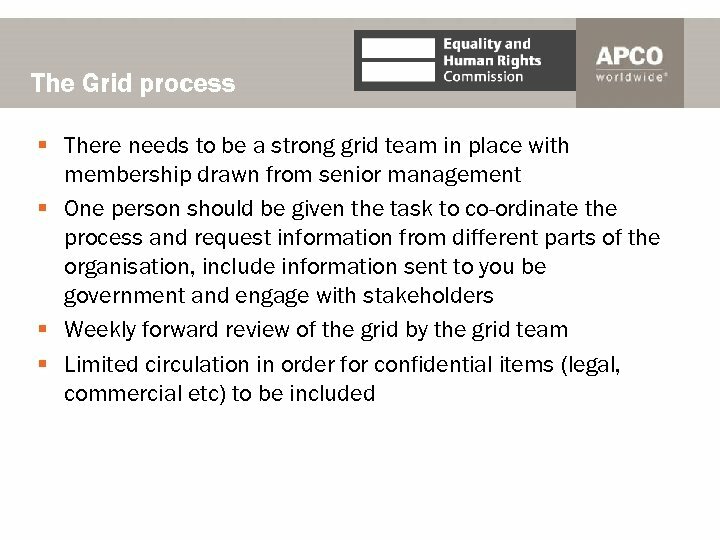 It provides the ground rules and helps to foster an environment in which people understand their rights and their mutual obligations to one another. 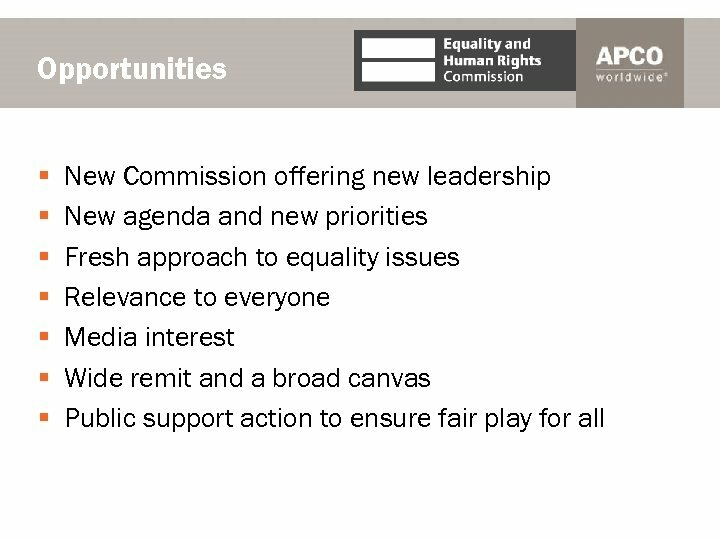 The Commission will maximise its opportunities to encourage the cultural shift Britain needs, including using its authority to promote good relations; a crucial lever that bolsters the Commission’s equalities and human rights powers. 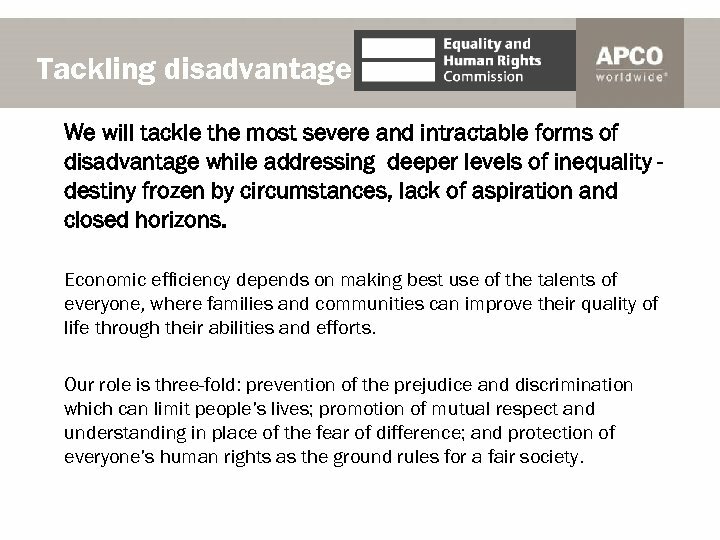 Tackling disadvantage We will tackle the most severe and intractable forms of disadvantage while addressing deeper levels of inequality destiny frozen by circumstances, lack of aspiration and closed horizons. Economic efficiency depends on making best use of the talents of everyone, where families and communities can improve their quality of life through their abilities and efforts. Our role is three-fold: prevention of the prejudice and discrimination which can limit people’s lives; promotion of mutual respect and understanding in place of the fear of difference; and protection of everyone’s human rights as the ground rules for a fair society. 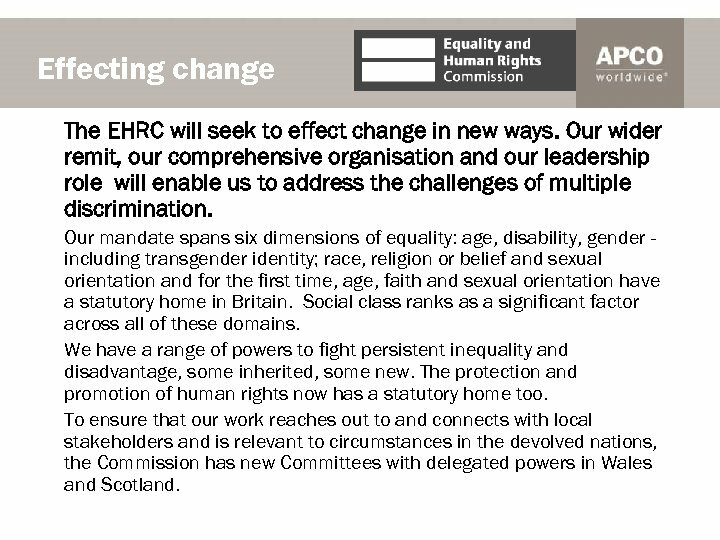 Effecting change The EHRC will seek to effect change in new ways. 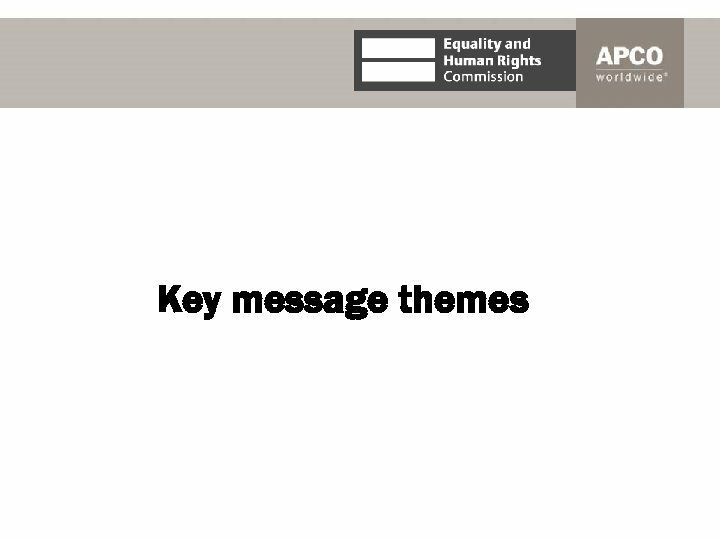 Our wider remit, our comprehensive organisation and our leadership role will enable us to address the challenges of multiple discrimination. 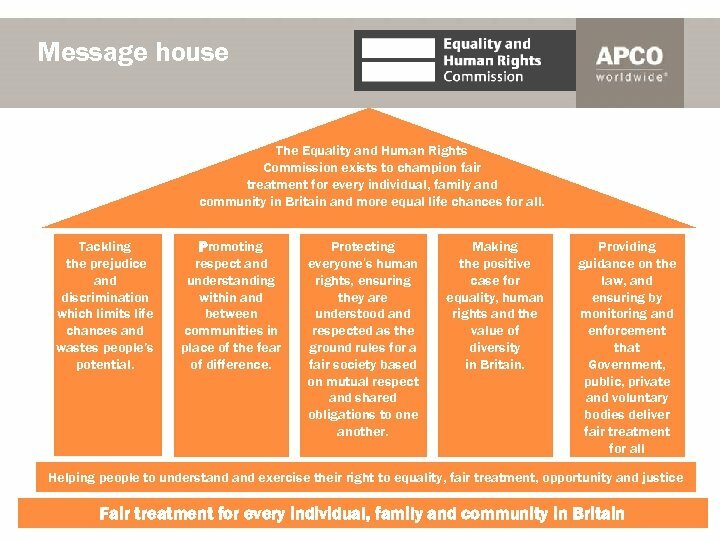 Our mandate spans six dimensions of equality: age, disability, gender including transgender identity; race, religion or belief and sexual orientation and for the first time, age, faith and sexual orientation have a statutory home in Britain. Social class ranks as a significant factor across all of these domains. 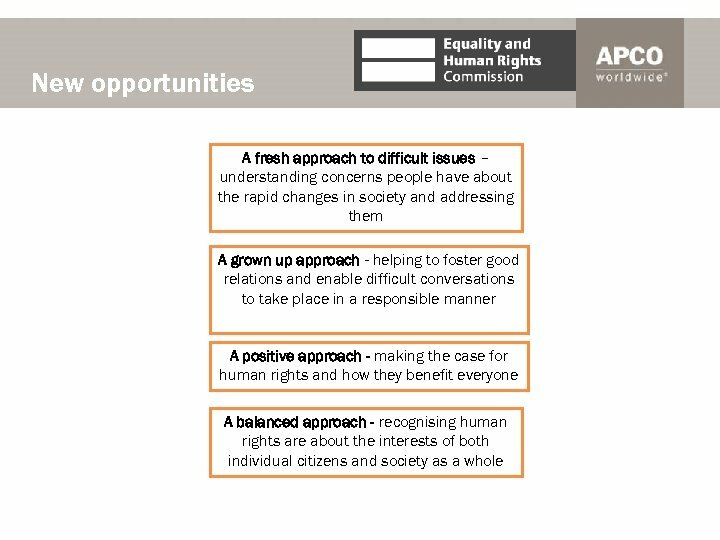 We have a range of powers to fight persistent inequality and disadvantage, some inherited, some new. 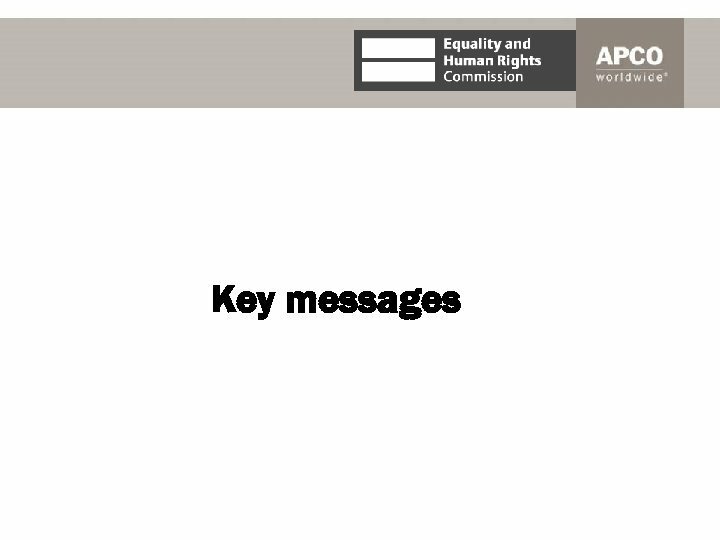 The protection and promotion of human rights now has a statutory home too. 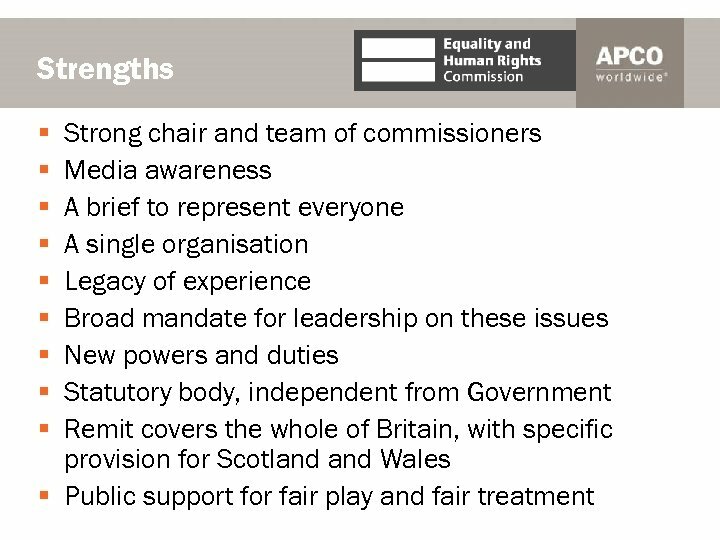 To ensure that our work reaches out to and connects with local stakeholders and is relevant to circumstances in the devolved nations, the Commission has new Committees with delegated powers in Wales and Scotland. 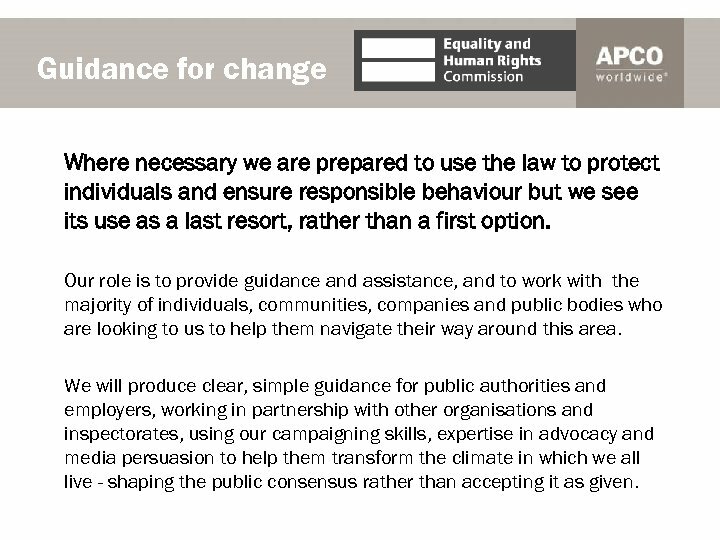 Guidance for change Where necessary we are prepared to use the law to protect individuals and ensure responsible behaviour but we see its use as a last resort, rather than a first option. 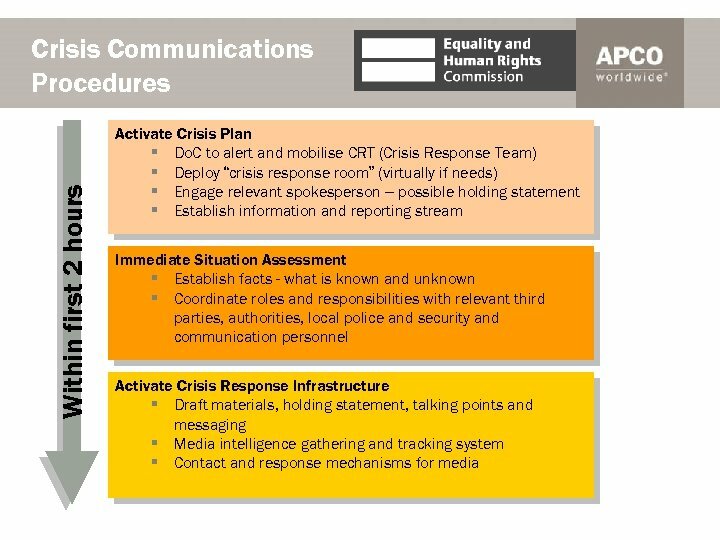 Our role is to provide guidance and assistance, and to work with the majority of individuals, communities, companies and public bodies who are looking to us to help them navigate their way around this area. 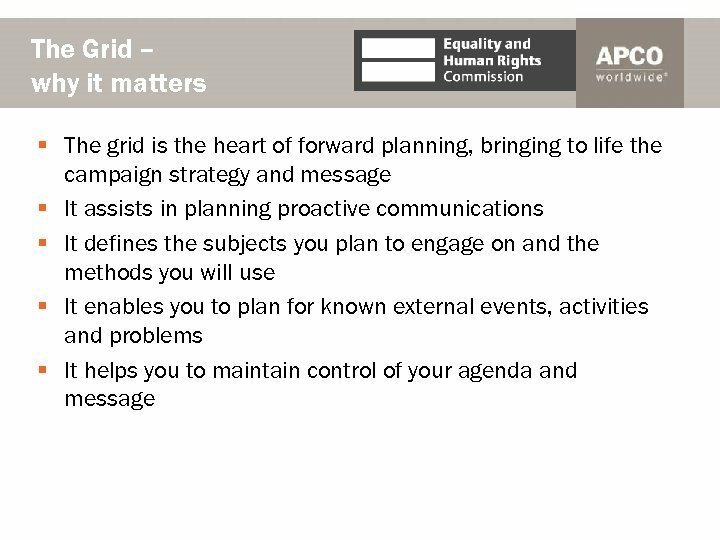 We will produce clear, simple guidance for public authorities and employers, working in partnership with other organisations and inspectorates, using our campaigning skills, expertise in advocacy and media persuasion to help them transform the climate in which we all live - shaping the public consensus rather than accepting it as given. 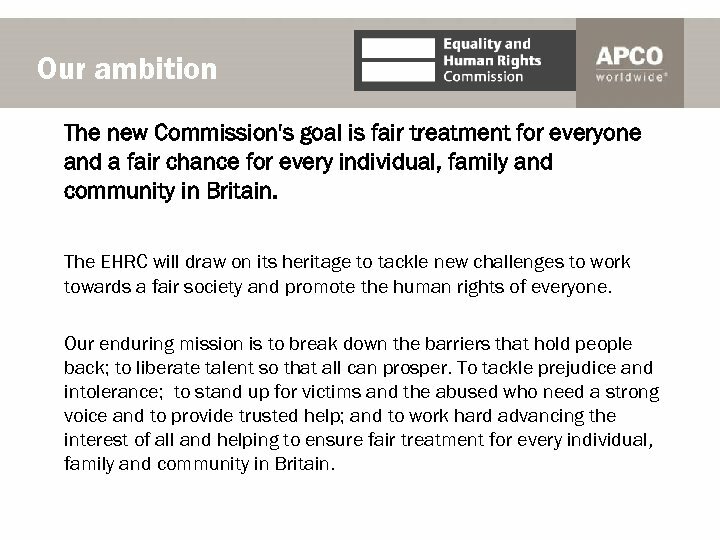 Our ambition The new Commission's goal is fair treatment for everyone and a fair chance for every individual, family and community in Britain. 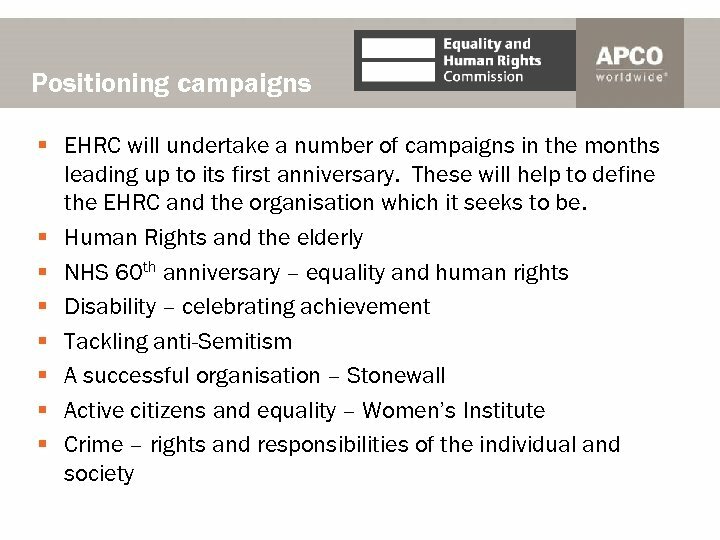 The EHRC will draw on its heritage to tackle new challenges to work towards a fair society and promote the human rights of everyone. Our enduring mission is to break down the barriers that hold people back; to liberate talent so that all can prosper. To tackle prejudice and intolerance; to stand up for victims and the abused who need a strong voice and to provide trusted help; and to work hard advancing the interest of all and helping to ensure fair treatment for every individual, family and community in Britain. 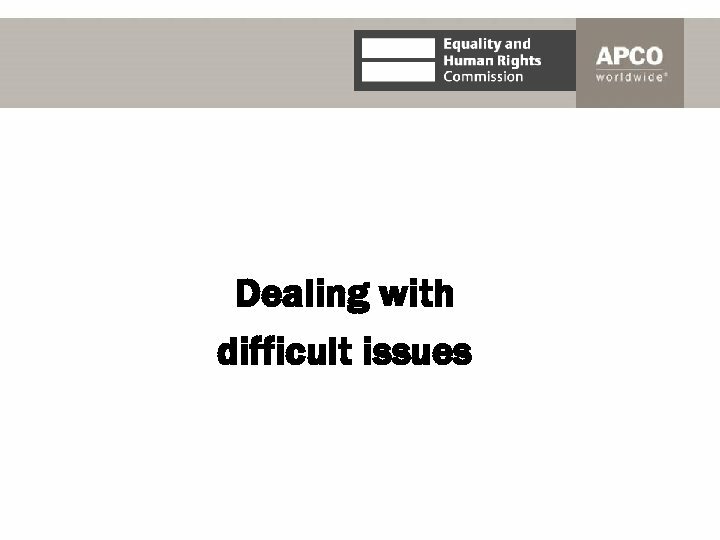 Dealing with difficult issues The EHRC will often be involved in or be asked its opinion about difficult or contentious issues. 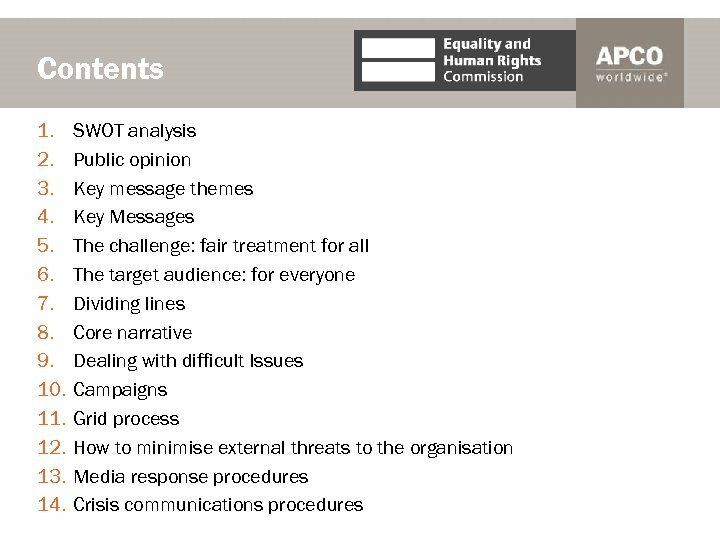 The way in which we approach these questions will define the public’s perception of us and the sort of organisation we are. This is why it is important that we engage on the topics that we choose to, in a way that we decide to and within a framework that is consistent in as far as possible within our control. We lead on these issues. We do not follow the agenda of others. In doing so, there are some questions that we can ask which help to provide us with a framework for dealing with these matters: § what are the facts of the case? § what is the actual point of conflict or real issue of dispute? § is this an issue which needs to be resolved now or is it one that should be the subject of an ongoing debate? 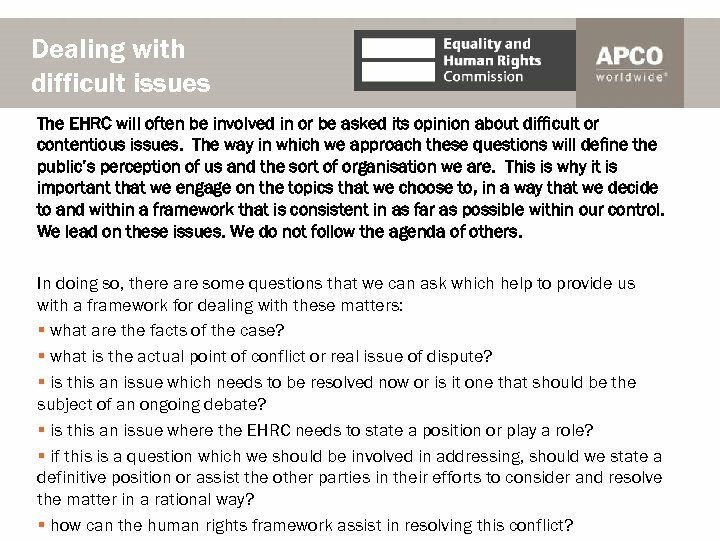 § is this an issue where the EHRC needs to state a position or play a role? § if this is a question which we should be involved in addressing, should we state a definitive position or assist the other parties in their efforts to consider and resolve the matter in a rational way? 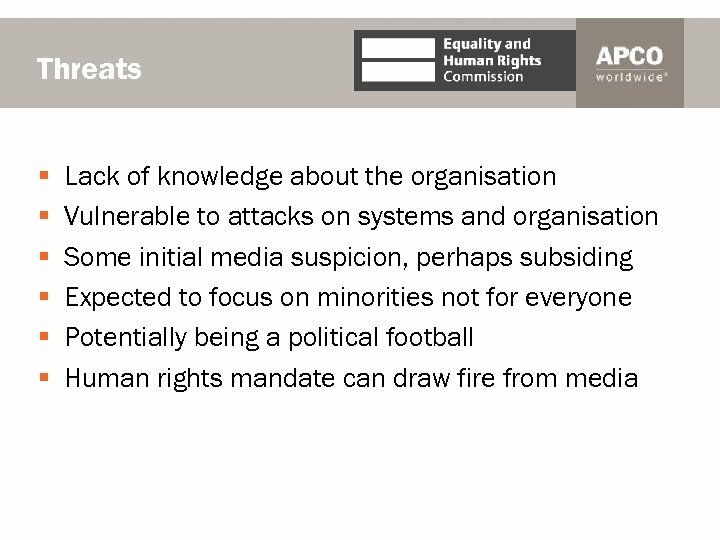 § how can the human rights framework assist in resolving this conflict? 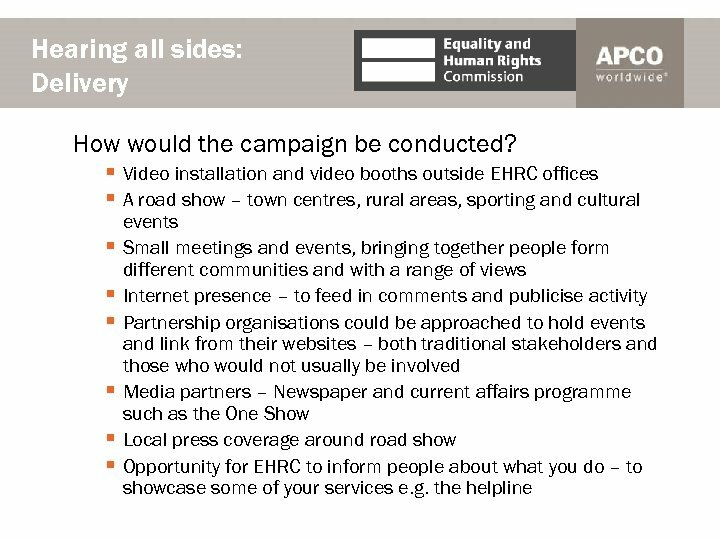 Hearing all sides A public-facing campaign which positions the EHRC as being for everyone and relevant to people’s lives. The purpose of the campaign is to engage with people from across society and to enter into a dialogue with everyone, even those who express difficult or controversial issues. 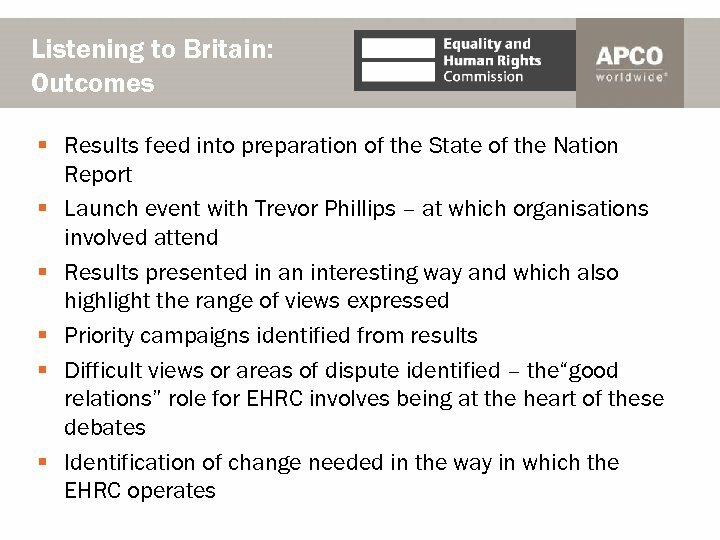 By doing so, we will demonstrate that the EHRC will engage on issues which are of concern to people in Britain. 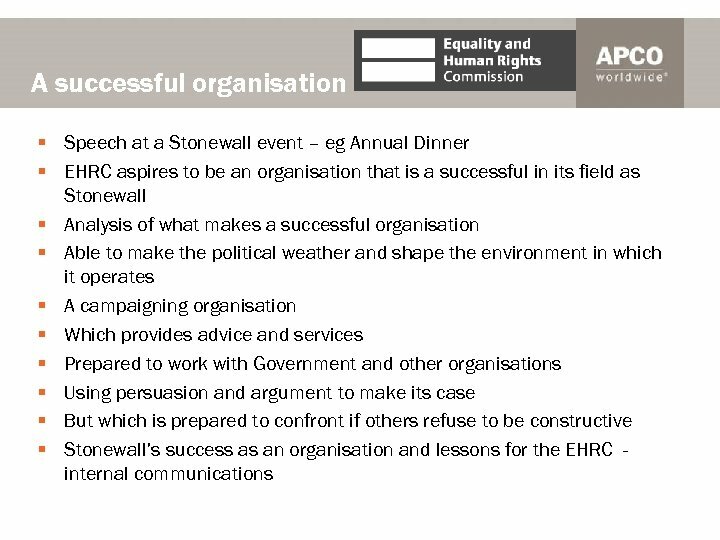 The expectation from critics of the EHRC is that it is an organisation that is only interested in engaging with certain strands of opinion. 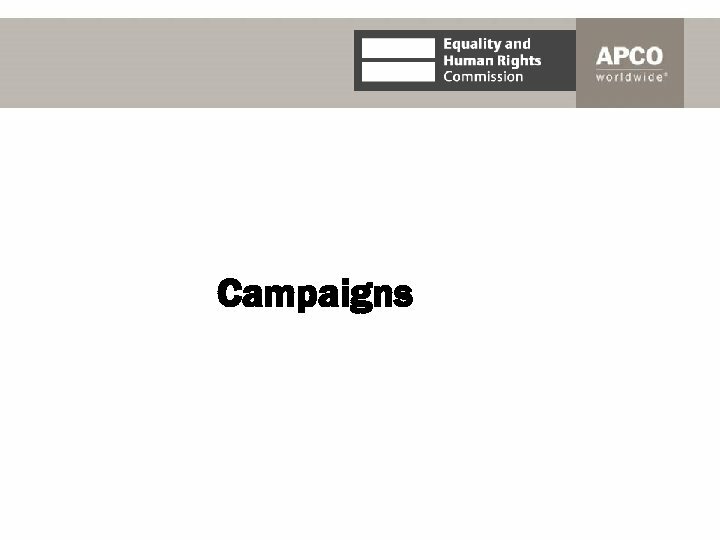 This campaign would demonstrate that this is not the case. 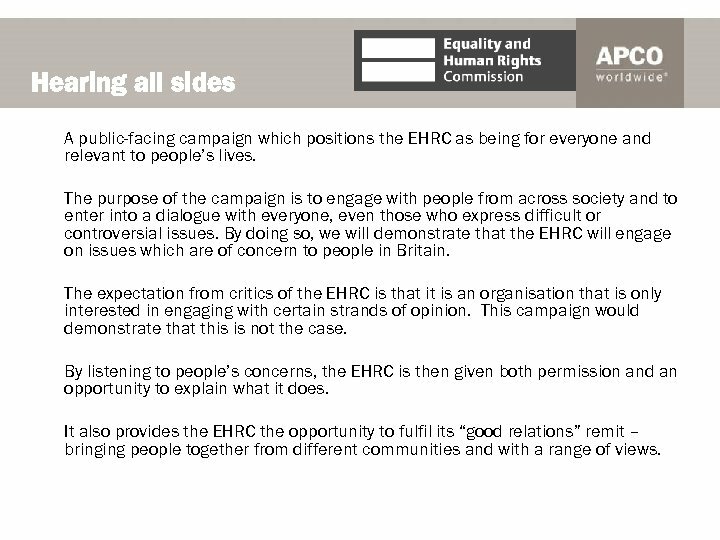 By listening to people’s concerns, the EHRC is then given both permission and an opportunity to explain what it does. 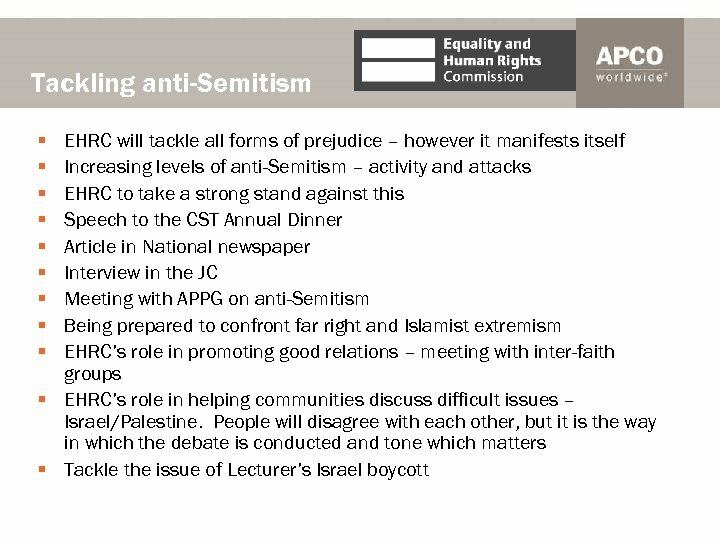 It also provides the EHRC the opportunity to fulfil its “good relations” remit – bringing people together from different communities and with a range of views. 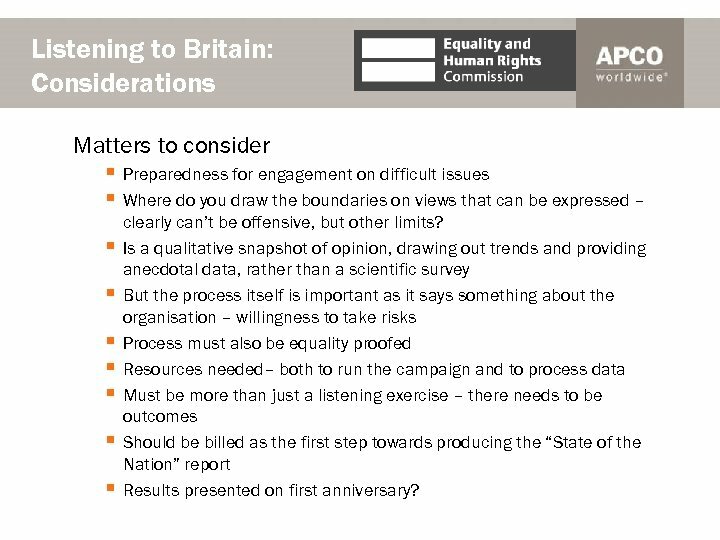 Listening to Britain: Considerations Matters to consider § Preparedness for engagement on difficult issues § Where do you draw the boundaries on views that can be expressed – § § § § clearly can’t be offensive, but other limits? Is a qualitative snapshot of opinion, drawing out trends and providing anecdotal data, rather than a scientific survey But the process itself is important as it says something about the organisation – willingness to take risks Process must also be equality proofed Resources needed– both to run the campaign and to process data Must be more than just a listening exercise – there needs to be outcomes Should be billed as the first step towards producing the “State of the Nation” report Results presented on first anniversary? 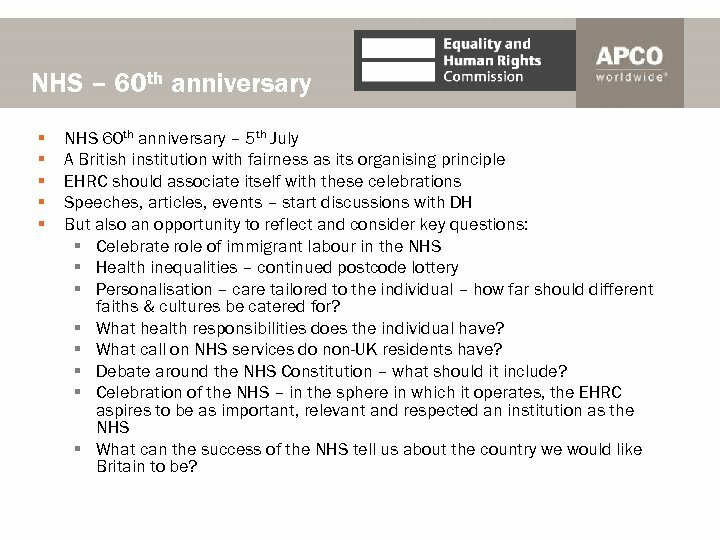 NHS – 60 th anniversary § § § NHS 60 th anniversary – 5 th July A British institution with fairness as its organising principle EHRC should associate itself with these celebrations Speeches, articles, events – start discussions with DH But also an opportunity to reflect and consider key questions: § Celebrate role of immigrant labour in the NHS § Health inequalities – continued postcode lottery § Personalisation – care tailored to the individual – how far should different faiths & cultures be catered for? § What health responsibilities does the individual have? § What call on NHS services do non-UK residents have? 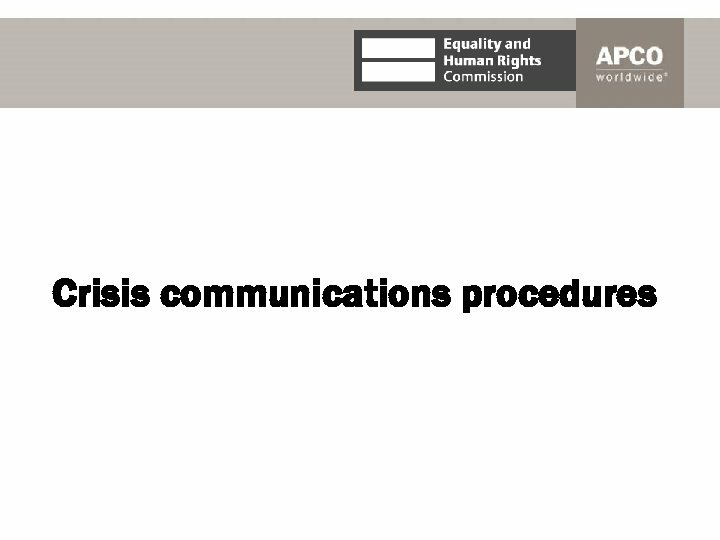 § Debate around the NHS Constitution – what should it include? 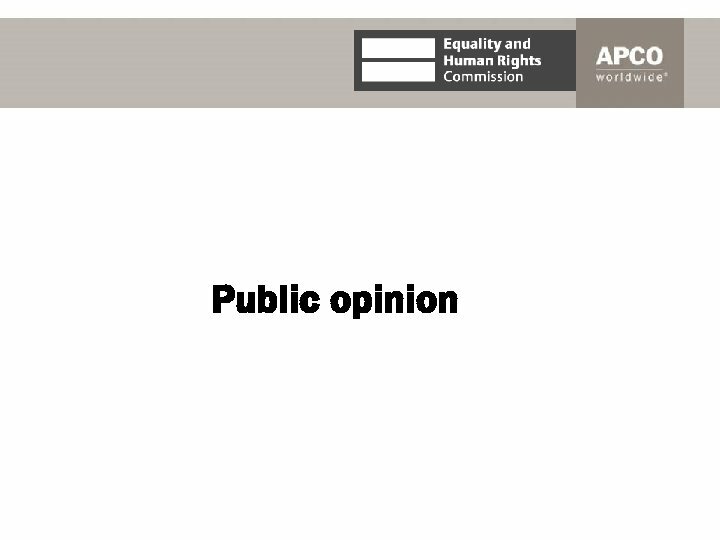 § Celebration of the NHS – in the sphere in which it operates, the EHRC aspires to be as important, relevant and respected an institution as the NHS § What can the success of the NHS tell us about the country we would like Britain to be? 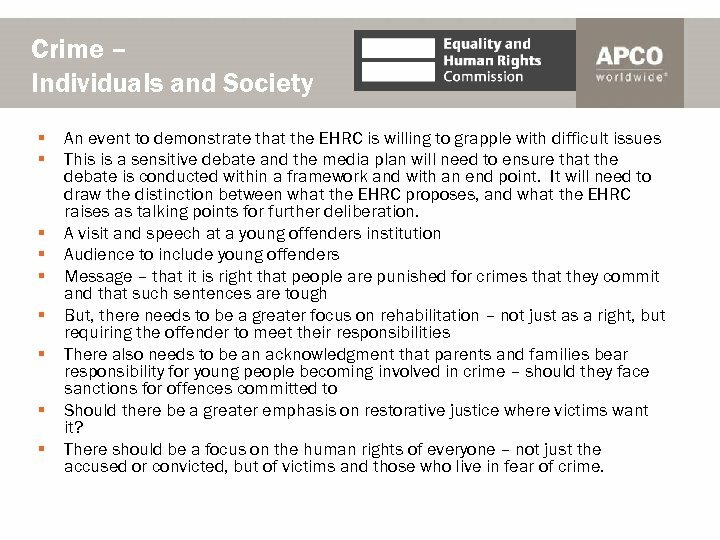 Crime – Individuals and Society § § § § § An event to demonstrate that the EHRC is willing to grapple with difficult issues This is a sensitive debate and the media plan will need to ensure that the debate is conducted within a framework and with an end point. 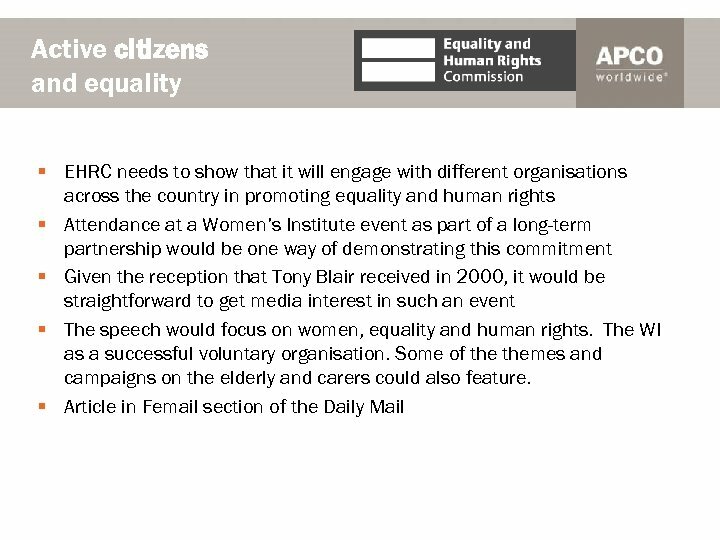 It will need to draw the distinction between what the EHRC proposes, and what the EHRC raises as talking points for further deliberation. A visit and speech at a young offenders institution Audience to include young offenders Message – that it is right that people are punished for crimes that they commit and that such sentences are tough But, there needs to be a greater focus on rehabilitation – not just as a right, but requiring the offender to meet their responsibilities There also needs to be an acknowledgment that parents and families bear responsibility for young people becoming involved in crime – should they face sanctions for offences committed to Should there be a greater emphasis on restorative justice where victims want it? There should be a focus on the human rights of everyone – not just the accused or convicted, but of victims and those who live in fear of crime. 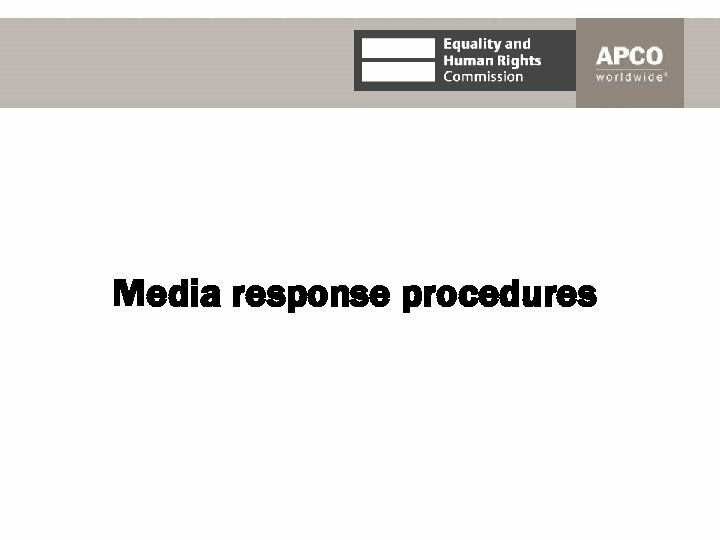 Media response thought process STOP Are you part of the EHRC press office? 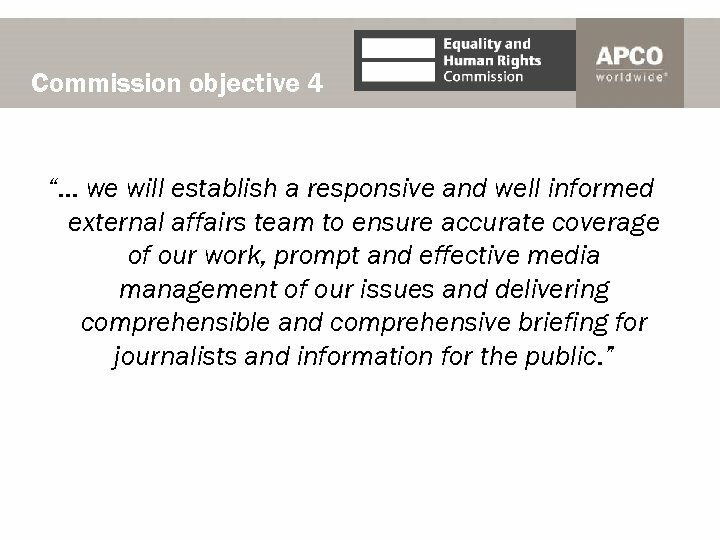 If no, refer enquiry to a press officer. If yes, this is your opportunity to ask the questions: Who? What? Where? Why? When? 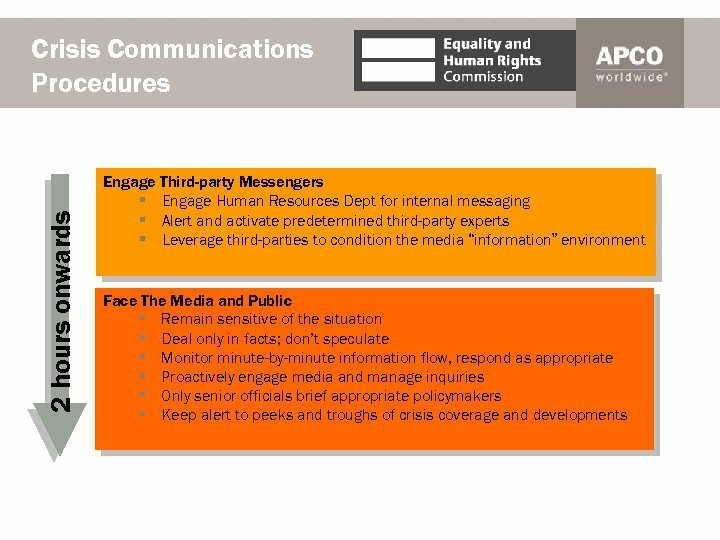 ASSESS What information do you need to gather? Who do you need to contact? Can the enquiry be addressed by an existing holding statement or ‘key message’? 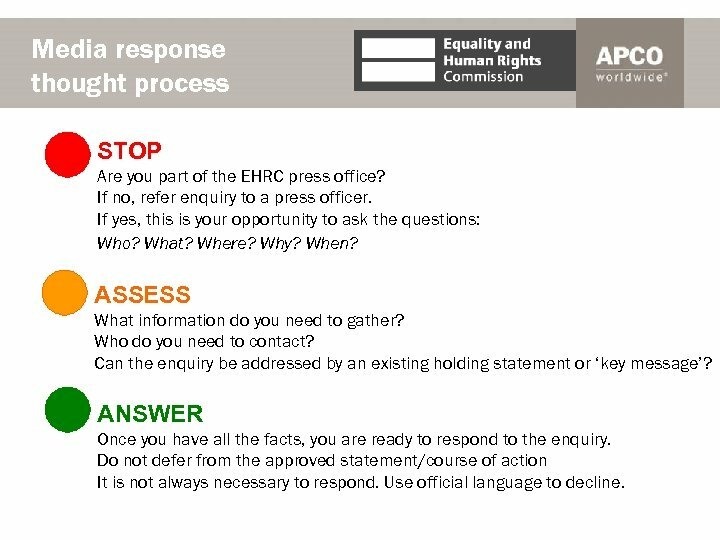 ANSWER Once you have all the facts, you are ready to respond to the enquiry. 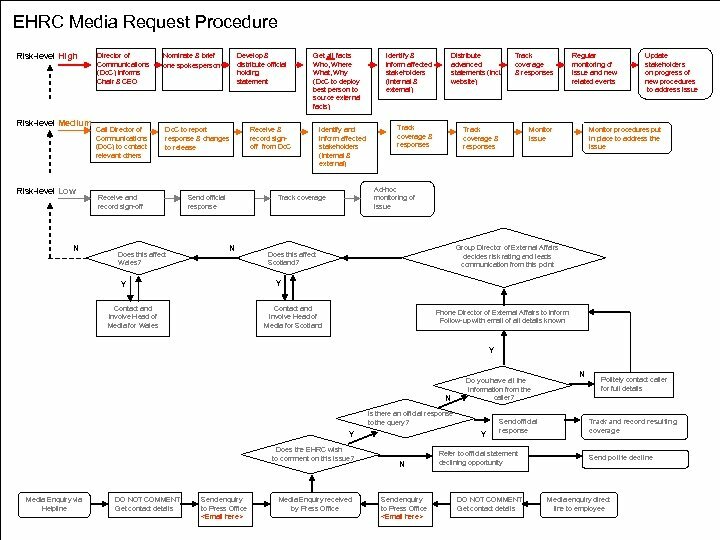 Do not defer from the approved statement/course of action It is not always necessary to respond. Use official language to decline.